A year ago, Jerry Paffendorf showed a friend from New York City how a house was up for sale in Detroit's North Corktown neighborhood via a tax foreclosure auction. That friend fell in love withDetroit, the neighborhood and the house and bought it online for just a few thousand dollars, less than a few months' rent in some places inNew York City. He planned on turning it into his Detroit home/studio. So, Michigan scores a newcomer. What often gets lost in the excitement of paying $500 for a house at an auction of 13,000 properties, a vast majority in the city of Detroit, is what comes after the money changes hands. More often than not, much more money will have to change hands when you enter the world of the Wayne County Property Tax Foreclosure Auction. Paffendorf, co-founder of the Corktown-based software firm LOVELAND Technologies. "A lot of these properties have good reasons why they're $500." Paffendorf had a front-row seat to the clash of cheap prices and realty reality. "(My friend) did send someone over there to clear it out and clean up the yard, but it's a year later and it's in worse shape," Paffendorf said. "It's not that the house overwhelmed him, but he got excited about it and then life got in the way." Paffendorf and his cohorts at LOVELAND Technologies created WhyDontWeOwnThis.com as the response to that scenarior and the well-publicized speculation taking place at the tax foreclosure auctions. The website uses an online mapping tool to detail each individual property with details such as actual condition, assessed value and a Google streetview image. It brings order to what used to be a phone book of confusing information, making it easily accessible to everyone -- for free. It puts local residents on an even playing field with speculators so they can take charge of the problem properties in their neighborhood and turn them into assets. Paffendorf knows WhyDontWeOwnThis.com won't solve all those problems, but he believes its can be part of the solution. "(The estimated 70,000-vacant-building problem in Detroit) is huge. It's just huge," Paffendorf said. "There is no other way to approach it. There are a lot of problem properties." In September, the Wayne County Treasurer's Office reported that sales from an auction that month totaled about $10 million -- "a 74 percent increase over last year's record-setting auction ..."
According to realtytrac.com, 1 in every 322 housing units in Michigan received a foreclosure notice in September, though not all of a tax variety. Wayne County is still the epicenter for foreclosures in Michigan, with a rate of 1 of every 206 units there with a foreclosure notice in September. Paffendorf said his friend is signing over the North Corktown house to a local group that will make better use of it. That process will be easy because the house is vacant. Many of the buildings that come up for auction, however, are occupied with squatters, former owners or renters. They all come with sad stories because every problem property comes from dysfunctional ownership. 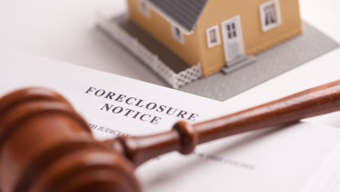 Anyone who buys a tax foreclosure will probably have to evict the current occupants. That process may take several months, cost hundreds of dollars and cause any novice property owners to do a good bit of soul-searching. Such factors are precisely why Ryan Cooley doesn't deal with tax foreclosures. Cooley co-owns the popular Slows restaurant and has been in real estate business for eight years. Most of that time, he has been as the owner of O'Connor Realty Detroit in Corktown. He pointed out that tax foreclosure buyers can't inspect a property until they buy it -- and then it only comes with a quit-claim deed. Title work and (hopefully) title insurance will cost a buyer hundreds more and take weeks, at a minimum. "We will never get into that because it's just not worth it," Cooley explained. He added that this is his least favorite time of the year because all of his customers ask about the tax foreclosure auction and there is no other building stock that is comparable price-wise. His office fields a couple of calls a day, on average, about the auction, mostly from people interested in properties in the greater downtown area and North Hamtramck, where there is a growing number of artists and Bengali immigrants. To Cooley, the tax foreclosure auction is the by-product of a broken system that gets everything wrong -- from taxes to code enforcement. Never mind trying to figure out who is really caught in the system and who is trying to game it. Cooley's one piece of advice: "You need to know if this one piece of property is worth it to you." There are a quite a few foreclosures for sale in Detroit currently. Many of the best deals can be found through online real estate auction websites (like as http://realtybargain.net/page/foreclosures-for-sale-in-detroit.html ), which offer starting bids of just $1.